1X 1 point per $1 spent on all other purchases. Elevated Southwest flying experience. Cardholders earn 4 upgraded boardings per year when available, 7,500 bonus anniversary points, and 20% back on inflight purchases. 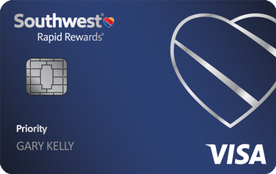 Our take: The Southwest Rapid Rewards Priority Credit Card doesn’t have as much heft as most elite airline cards, but it does offer enough value to justify paying the higher fee.